While millions of folks visit Paris, France every year and take in the sights, sounds, smells and tastes of this remarkable city, The City of Light, most stay in hotels and rarely venture into a supermarket (supermarche), a bakery (boulangerie or patisserie) or interact with the people of Paris. 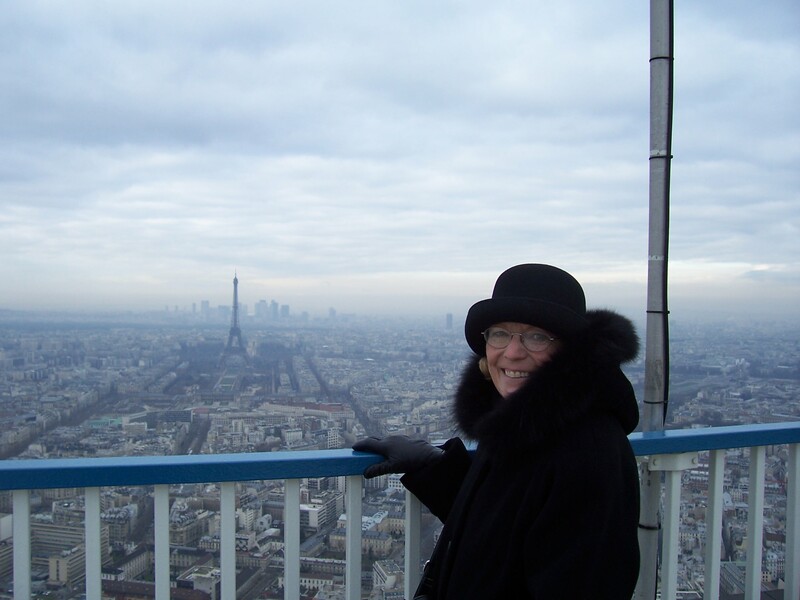 When my husband, Bill and I began traveling to France many years ago, we took the path less traveled and stayed in rented apartments. There are literally thousands of them in the city and they are readily available for rent from websites such as ParisStay.com, ParisAttitude.com or VRBO to name a few. In doing so we were afforded the opportunity to be part of the Paris community for short periods of two weeks to three months, to learn the language, to get to know the people of Paris for their kindnesses and their culture. The experiences have been priceless. This is only one of many. Ordinateur is a computer (en Francais) and it has only one small relation to this story… to show the reader I know the French word for computer, can pronounce it (you’ll have to take my word for that) and spell it. Far from showing off, I’m trying to redeem my self-esteem after my adventure at a small patisserie located on Rue Lecourbe about two blocks from our apartment during which I royally butchered the language of Baudelaire and Victor Hugo. The image of them rolling over in their graves will forever haunt me leaving me with two choices, frequent one of the other 4.5 million patisseries in Paris or go back to that one and show them I’m not the village idiot. One of our many and early insights into Parisian psychology is the discovery of their deep pride in the pronunciation and use of their language. It is a beautiful language, by the way, and the Parisian version is the standard to which we Americans are taught French. Oh yes, the patisserie. First a quick lesson. A patisserie is a specialty shop selling pastries and bread. A boulangerie is a specialty shop selling bread and pastries. Got that? Since this was our first day in the apartment, we needed supplies to get us through the weekend and, the most important supply in Paris is bread. It is cheap and its taste and texture move the taste buds to a higher level of understanding. The closest patisserie is across the street from our apartment. However, it was 2pm when I went in search of bread and they were sold out which speaks volumes about how much the French love their bread. The next nearest patisserie is a half block away where their remaining stock was exactly 3 baguettes and one petit boule (means little ball which is how it is shaped, sort of). I asked for the boule (Je voudrais le petit boule, si’l vous plait) and how much it cost (ce combien?). The clerk pronounced Euro something like zero which I interpreted to mean 1 and zero Euros (don’t ask why) and proceeded to give her 1 Euro at which she frowned (no translation necessary there, I had it WRONG and the line behind me is 5 people deep and I’m having the equivalent of the dream where you have arrived at school late and naked). She repeated the amount and I still didn’t get it. I was contemplating giving her my entire wallet and leaving when the gentleman behind me said, in perfect English, “She needs 1 Euro and 10 centimes, madame.” Such a small incident but, in broad strokes, so French. I had butchered their language, was looked on with disdain and was rescued by another French person who, to the delight of everyone present, spoke my language far better than I understood spoken French. It’s entirely possible that I endeared myself to the bakery staff and all the waiting customers. 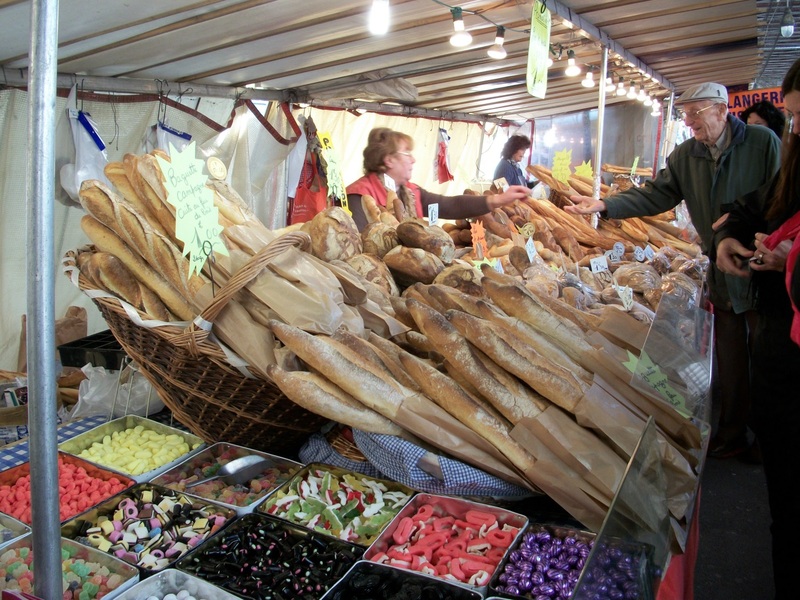 Baguettes for sale at the Rue Cambronne open market only a few feet from our front door. One curiosity… and it’s possibly due to the neighborhood where our apartment is located this time… but, we have been here one day and met four Parisians who speak relatively good English… relative to our French, that is. Counted in the four is the young man who met us at the apartment to orient us to our temporary home for the next 2 months. 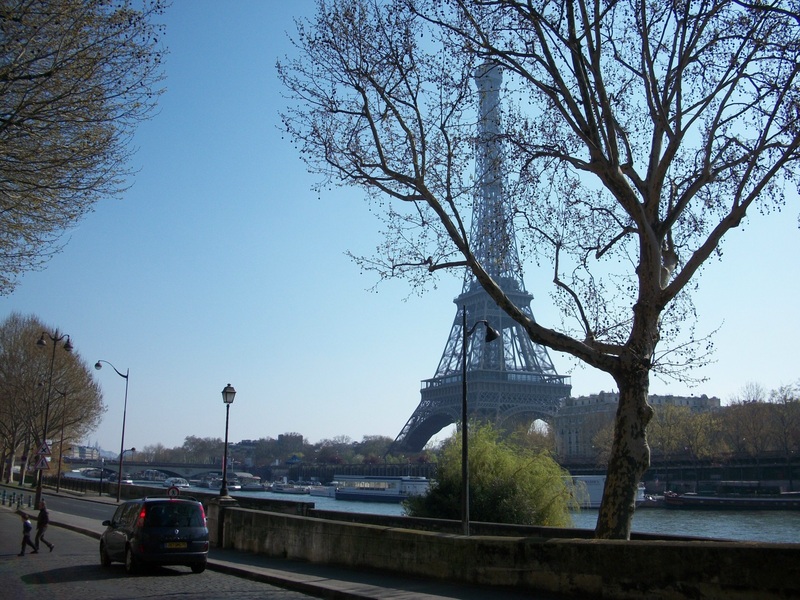 The apartment is located in a lovely residential neighborhood on Rue Cambronne in the 15th Arrondissement, or district, of Paris within walking distance of the Eiffel Tower. Our French and his English were pretty much on par one with the other… par being “not too good”. We communicated with each other remarkably well by means of chopped Franglish. Then there was the couple who rescued us from being trapped inside our own apartment building… not the apartment, the building. We couldn’t get out. Okay, this may take some explanation. There are little round electronic devices attached to the key chains holding our apartment keys. They are used like a wand to get into the apartment building, onto the elevator and, it appeared, out the main door to the building… no, there is no door knob or lever. The little round things worked to get us into the building and onto the elevator but failed us when we tried to leave the building… it was probably a warning for us to stay in the apartment because we were still too blitzed from jet lag to function well in intelligent society. In addition to trying to use our little electronic wands, we pushed every button in the lobby… including the one that let us into the trash disposal room… good information for later. Feeling trapped and a little panicky we waited for someone else to use the door at which time I asked (in my perfect Franglish) how we might get OUT of the building. This lovely French couple explained to us in perfect English that the spot we were “wanding” with our electronic key was actually a button which when pushed allows one to exit the building. For the fourth French-type person who spoke very good English refer back to the “village idiot at the bakery” paragraph. Okay, tomorrow is, well, another day and, after a good night’s sleep and the fact that we can now get out of the building, it will be a great day. Today’s guest blogger. Thanks Sandy! 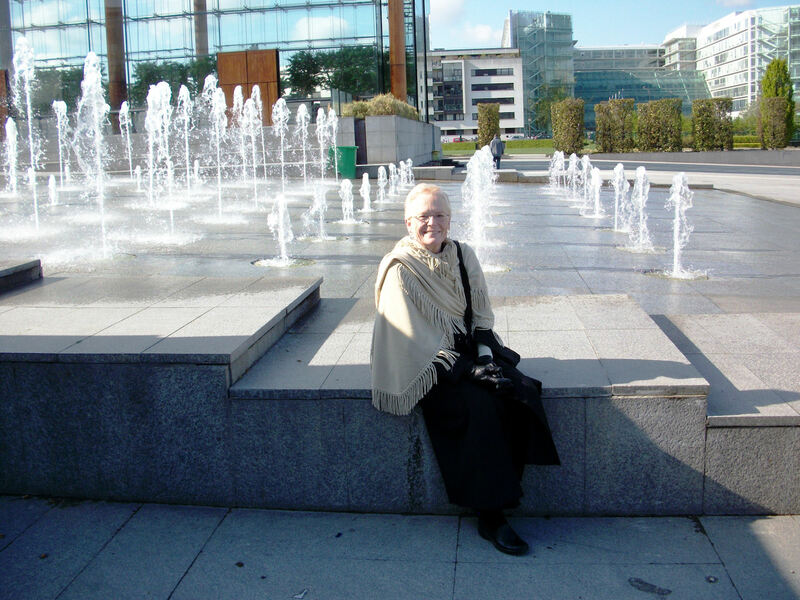 Sandy Conner, lover of France, its people, its culture and its language. I love these little “slices of life”! Thanks so much for sharing some of your adventures Sandy. Yup! That sounds like Paris! What a great article. It really is something to be in a foreign country where the language is a barrier. But it sounds like you always could count on nice, helpful people to get you out of tight spots. What wonderful memories you must have of Paris. I was laughing so hard at this!! I can completely relate.